Saul Alinsky is alive and well in the political maneuverings of the secular left. The problem is, we all have the play book now. As most know, Rush Limbaugh has been under fire of late for comments he made about 30 year-old “reproductive justice” radical Sandra Fluke. Ms. Fluke recently gained national attention while testifying before Congress. There, she demanded that Georgetown Law, a Jesuit University, underwrite her stated fornication practices by paying for her and other students’ birth control and, ostensibly, abortions. Fornication and abortion, of course, are considered “mortal sins” in Christianity. Catholic doctrine further bars the church from providing contraception. Not really. Actually that bile came from the revolving pie-hole of MSNBC’s Ed Schultz in reference to conservative talk radio host Laura Ingraham. Ms. Fluke recently went on Schultz’s program to criticize Limbaugh for indirectly suggesting that, in light of her admitted sexually immoral lifestyle, she was a “sl-t” (an offensive and inappropriate slang for which he has apologized). Mainstream media-types have no interest in this double standard because they share it. They’re duty-bound to ignore the palpable hypocrisy. To do otherwise would undermine the absurd “GOP-has-declared-war-on-women” narrative. (By ‘women,’ of course, they mean liberal women – outnumbered by Rush-supporting conservative gals two-to-one). 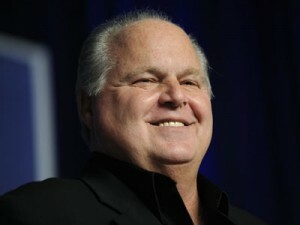 Indeed, Rush Limbaugh has become the left’s flashpoint in this twofold election year ploy to both sour women against the GOP and distract from Obama’s impending debt bomb, skyrocketing gasoline prices and the threat of a nuclear Iran. Yes, how can we focus on trillions in Obama debt, $6.00 gasoline and Islamo-fascists with nukes while a Georgetown “coed” is being denied free medication from Christians for her “Saturday night fever”? Well, I have it on good authority that today Rush is chewing a big fat Padron Toro and laughing himself silly. Every time McCarthyite liberals take a swing at El Rushbo, they get their hemp-clad heinies handed to them. It’s like watching Andre the Giant toss midgets. This comes as little surprise. One such sponsor, Carbonite, saw its stock plummet by twelve percent overnight after announcing it was pulling its spots. This is what happens when a company puts partisan politics over profit. Birth control at Walgreens? A few dollars. Taking personal responsibility for your own lifestyle choices and consequences? Priceless. That’s all Rush was saying.